More and more of us are taking our dogs on vacation with us and why not!? 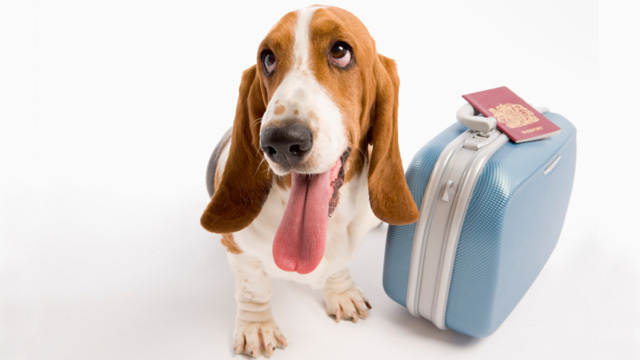 Dogs make great travel companions. They are often excited to watch the world go by in the car and sniff and explore new plants, hydrants, and people. Their enthusiasm can remind us to live in the moment and enjoy the small things. When traveling with our pups it’s important to make sure we have the right gear so things go as smoothly as possible. This year, before hitting the road, do a little shopping and get your pup the essential gear for a great vacation. 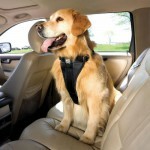 Car Safety – Dogs like to look out the windows and sometimes bounce around the car from seat to seat with excitement. As cute as that is, it can distract us and in the case of stopping short, your dog could get hurt. Invest in a car seat or harness or both to make sure your pup is safe. The Kurgo Tru-Fit Harness comes in several sizes and the Snoozer Half-Bench Booster Seat is a great cushion that allows your pup to see out the windows without having to stand up and perch. Going for a hike? Your working dog will be happy to help carry some stuff, especially their food, treats, and bowls. Kyjen’s Backpack is a great accessory for dogs who naturally are inclined to work and can take a few pounds off your back. A sturdy backpack ensures that your pet will be able to carry items without it hurting their spine and hips. It’s also great for training and tends to put your dog into a mentality of traveling with a pack which can make hiking a trail easier for you. Bowls – Bamboo Collapsible Travel Bowls are perfect for any trip. Instead of trying to fit the big bowls from home into a bag, having ones that become compact and take up little space leaves more room for important things like your dog’s favorite toys! Speaking of toys, don’t forget to pack a few for your dog. Playtime is essential and if your dog does get a little nervous in new places, having something to chew on and that smells like “home” can help calm those nerves. You can also pack a new one as a reward for being a good pup and help build some confidence as well as distract your dog from the anxiety s/he may be feeling. A sturdy leash or hands free leash is great for hiking, jogging, and taking walks with your pet. The Buddy Connector connects to your waist, bike, and backpack leaving you hands free and your dog still safely connected to you. Identification – Check that the information on your dog’s micrchip is up to date but also having a collar with tags that contain your dog’s name and your cell phone number are important. 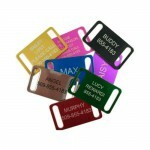 If your dog’s current tags are looking a little worn out, get some new ones made before your big trip! If you’re like me, you may want to make sure the tag doesn’t fall off, Slider Tags slide right onto the collar. There’s no jingling, no keyring that can snag and break, and it’s silent since it doesn’t jangle and jingle against other tags. What other supplies and gear do you pack when traveling with your pup?